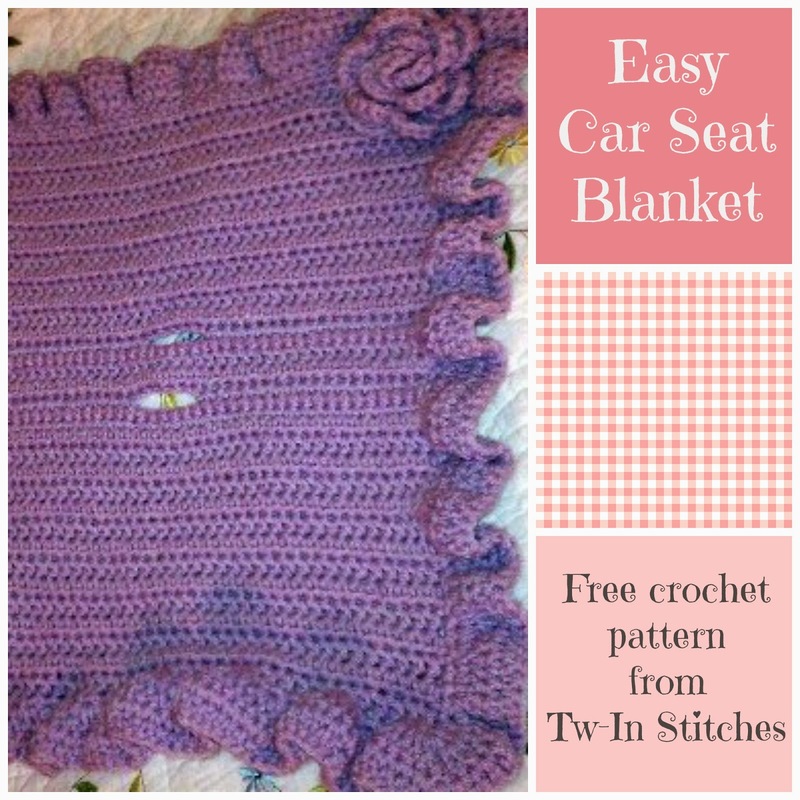 Last year, BreeAnna from String with Style shared her awesome pattern for a fantastic car seat blanket. It is a great pattern and the resulting blanket is lovely. Do you see those two slits right there? Those are holes for the bottom buckle of the car seat to fit through. The beauty of this blanket is that it stays on the infant car seat without dropping our falling off without interfering with the safety straps. Just that little part of the blanket is held under the buckle and this keeps it on! Brilliant. This has become my go to pattern for baby shower gifts. Not only does it look like I worked really hard on it, but it is awesomely functional. The other day, I started working on a new blanket for a coworker and was not feeling the bobble love. BreeAnna's pattern uses the bobble stitch to make those great bumps in the blanket. They are adorable, but frustrating at times. You have to keep careful count of your stitches to make sure that the pattern works. I was feeling blah and wanted to just make a blanket I didn't have to think about after the first row of chains. In addition to that, I only had DK weight yarn which is much too thin for the Bobble Blanket pattern to work correctly. Using BreeAnna's pattern as inspiration, I came up with a pattern for my own car seat blanket. The part for the buckle holes is all BreeAnna's work applied to my pattern. Thanks, BreeAnna! Row 18-19: Chain 2 and turn. HDC in each stitch across. (42 HDCs). Row 20: Repeat row 16. Row 21: Repeat Row 17. Row 22-37: Chain 2 and turn. 1 HDC in each stitch across. You can do whatever you would like for your border. For mine, I wanted a feminine look, so I made a ruffle border. Row 38: Chain 1. SC in each stitch around. Place 2 SCs in each corner. Row 40: Chain 2. 1 DC in each stitch around. I also added a flower to mine because it did not feel finished. I hope you enjoy making this blanket as much as I did. Enjoy! Super cute, Jen!! Is row 39 ch 2, 2DC and then 3DC in every other stitch around? I think you forgot the word stitch, so I just wanted to make sure! Will have to try and tackle this one the next time a baby comes along! This is adorable! I love it. Thanks for sharing it. I'd like to make one, and am thinking of using cotton yarn, to make it a little heavier. Think that will work? Also, how much yarn did it take? Cotton yarn would definitely work. I used Caron's Pound of Love, but I don't think I used the entire skein. I used approximately 3/4 of it. Omg..the flower just completes the blanket. Thank you for the pattern! This is adorable! I would love to make this. Do you think that Caron Soft would work? Thanks for sharing. It will! Watch the gauge so that it is big enough to fit across the car seat. I can't find the original pattern I used, but this one is very much like it in the construction. I'd love to see your blanket on Ravelry! Thank you, Jennifer. This black kettle pattern has come at a perfect time. A friend of mine daughter is expecting a baby in September. I will make this blanket as a gift. I'm looking forward to making this pattern. I'm wanting to make this for my niece who will be born in late September, so a good car seat blanket will be great for her! How much yarn did it take? I'm lookin at the snuggly wuggly- big! Skein. Did you use 2 separate skeins because it calls for 2 threads held together, or did you just use both ends of the same skein? Thanks! Courtney, I used one big skein. I pulled the end from the middle and the end from the outside. Viola! What is the size of the blanket when completed? Thanks! What would it do if I only use one strand? That depends on the size of your yarn. Since I held two strands of size 3 yarn together, that would mean a substitution of a size 5 yarn. You could try a worsted weight yarn, but check your width to make sure it is covering the seat to both sides.